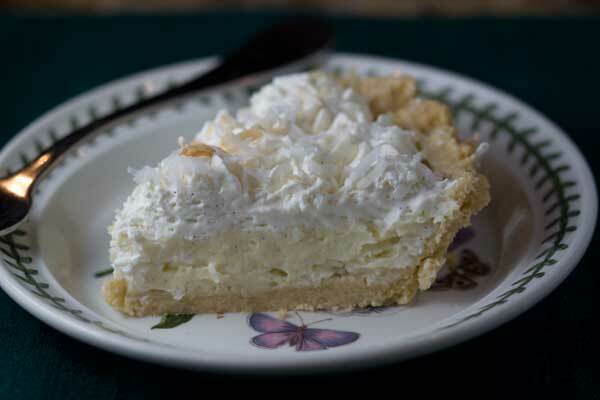 Coconut Cream Pie with Half & Half is one of our family's favorite coconut cream pies. This recipe gives you a lot of whipped cream topping so if you want less, use the amounts in parenthesis. In a heavy saucepan off heat, whisk together the sugar, cornstarch and egg yolks. Gradually whisk in the half & half, then put the pan over medium heat. Continue whisking until mixture starts to boil, then continue whisking as it boils for 1 minute. Remove from heat and whisk in the butter, salt, both extracts and the coconut. Put in a bowl, press a piece of greased wax or parchment paper over to keep skin from forming and let cool to room temperature. When cool, transfer to your baked pie shell and chill. Whip the cream until soft peaks form, then add powdered sugar and beat until stiff. Beat in vanilla. Pipe or spread over the pie. If you have some additional coconut, toast it in a dry skillet, let cool and sprinkle over the top for garnish. This pie was adapted from Crisco's collection. I usually use their basic pie crust recipe as well, or make a butter crust -- whatever I'm in the mood for.